Torso pitch: -35° to +40° while standing. -35° to +50° while crouching. The Madcat (Clan designation Timber Wolf) is an iconic Clan Heavy Mech, widely known and easily recognizable thanks to its fairly unique silhouette. It is also hands-down one of the most powerful Heavy Mechs, and its staggeringly high cost reflects this. It is armed to the teeth with a ludicrous array of Weapons, possesses unbelievable speed and maneuverability for a Heavy Mech, and is comparatively heavily armored. Perhaps its only weakness is a lack of jump jets. All the Madcat variants make use of powerful weapons, and while relatively lacking in the Equipment department, some variants mount an AMS system, giving them limited protection against enemy missile boats. 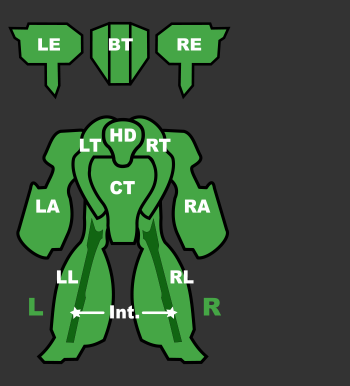 It is important to note that the Madcat's Cockpit is relatively vulnerable, and its Center Torso can be attacked with relative ease due to its protrusion outward, as well as the fact that its arms do not provide side protection. The Madcat Prime is a mighty late-game Mech, capable of dispatching even Assault Mechs with relative ease. 2 CLRM20's give it the ability to soften targets at range, while an array of 2 CERLBL's, 2 CERMBL's and a CMPL allow it to pummel any target from middle- to long-range. 2 Mguns give the Prime variant limited Anti-Air capabilities, and when coupled with the multitude of Lasers and pulse lasers, make it a frightening Battle Armor hunter. Equipped with Eoptics, the Madcat Prime can effectively engage targets at almost any range, and its speed and armor allow it to survive all but the most determined and powerful assaults. 11 Double Heat Sinks can struggle somewhat dealing with the heat generated by all its Energy Weapons, so consider re-grouping and chain-firing the heavy hitter weapons. 2 extra tons for its LRMs allows the Prime's effective combat presence. The A variant is designed on a simple paradigm: CERPPC's are good but hot, while Ultra Autocannons are good but not very hot. The result is a frightening Heavy Mech with 2 CERPPC and 2 CUAC10. With this simple but powerful array of weaponry the Mad Cat can engage and devastate at all ranges. It only slightly suffers at long ranges, having "only" 2 CERPPC to fight with. However, in order to be able to fit this symmetrical weaponry, concessions had to be made. In the A's case, it was heatsinks, so it runs hot. Like the Prime, consider chain-firing the ERPPCs to better control the heat spikes. The Madcat B does away with any sort of Missile launcher, and focuses entirely on direct-fire Weapons. The primary punch at mid- to long-range is provided by 2 CERLBL's and 4 CERMBL's; additional firepower is provided by the single CGauss. It retains the 2 Mguns and the Eoptics found on the Prime variant while additionally being protected by LAMS, allowing it to adapt to most situations. 10 double heat sinks can barely manage the heat from all the Lasers, firing discipline is a must. An extra free ton for CGauss ammo gives the Madcat B respectable staying power. Use the B's speed to keep the distance open and maximize the long range onslaught. The only Madcat to fulfill the artillery fire-support role, the C relies on TAG or NARC teamwork to bring its massive ArrowIV launcher into deadly effectiveness on the battlefield. Being able to rain down the 4 massive missiles on targets up to 3 km away can send the opposing team to scuttle from an entrenched location, breaking their firing lines up and allowing friendly assets to close on them. The Madcat C's speed allows quick repositioning under the stealthy cover of GECM while its TAG permits self-guidance of its arrows and other friendly missiles up to 1300m to the unfortunate enemy target. A quad array of LBX2s give similar ranged harassment capabilities while the pulse lasers give limited protection on enemies that close the distance. Keep the distance open at all costs! The Madcat D takes more of a direct fire support role and is surprisingly effective at it. Mounting a single heavy large laser, dual UAC5s and twin clan LRM15s let the Madcat cause crippling damage to anything that isn't paying attention to it. 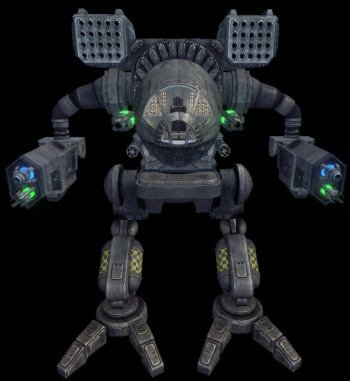 This mech is best used with a team mate, they will have the enemy's attention while the madcat cripples it from mid range with his weapons. 4 tons of ammo keeps it in battlefield engagements for a long time, dishing out an almost constant high volume of firepower due to its sufficient cooling system. The Madcat D also comes with LAMS to provide some missile protection. This variant is best used at medium range, where it can bring all of its firepower to bear. The Madcat E is a extremely potent mid to long range fighter, using CERPPCs to provide the long range punch until it can bring its twin ATM12s on the target, which can cripple most mediums and some heavies. This variant has two free tons of ammo which let it spend more time on the field, but since its damage is mostly in its ATMs, it's recommended you return for ammo when you run out. And with its damage being in the ATMs, that's the best way to counter the E; getting within 120m where the ATMs do no damage. BA would still have to be careful though as the ERPPCs do splash damage. It's also one of the rare Madcats that has GECM which can allow an initial surprise volley of 24 ATMs. With 8 DHS you should use caution when you don't chain fire your PPCs. Brawling is life, brawling is love - the Madcat F's mantra. Evaluate your prey from distance, choosing the heatsink challenged ones as the most juicy targets then quickly close the distance to your victim under the cover of LAMS and terrain. Blast your way through their armor with the powerful UAC20 while pelting them with a constant screen shake from the ATM9 high-explosive and triple CSSRM2s set in chain-fire mode. Blind them at point blank range with the searing heat of six Flamers and laugh when you witness them belching overheat explosions. Just don't get too much flamer-lust and toast yourself! A vicious brawler, with even more punch than the F at the expense of ability to disrupt the enemy with flamers like the F can. Its Ultra heavy Lubalin autocannon and Lubalin autocanons carry a fearsome punch that is not to be underestimated, especially supplemented by its DSSRM4. To pick off weakened components or tracking lighter mechs, two Medium Heavy Lasers and four CSPL are more than capable of slicing through most assets. However, care must be given when using the lasers as this cat only has a paltry 5 DHS. With careful heat management, it's power is almost unrivaled in a brawl, but it struggles if it's caught at range since only its LBX5 can plink at targets from a distance. The term "Madcat" is actually an Inner Sphere code name for the Clan Timber Wolf Omnimech. Upon first seeing the Timber Wolf, the Inner Sphere noted its appearance as a combination of the Marauder (designated MAD) and the Catapult (designated CAT); thus, the resulting Madcat. When the Timber Wolf first appeared on The Rock during the Clan Invasions, Inner Sphere commanders were stunned by the speed and power of the Heavy Mech, and strove to steal its secrets with limited success. The Timber Wolf is vastly more powerful than either the Marauder or the Catapult. It uses its speed and firepower to engage an enemy at the range of its choosing. This page was last edited on 13 April 2019, at 00:29.